Junior judge...grandson Rupert at Bendigo! The stud was established by my grandfather, Alex McIntyre, in 1932 at Skipton in the Western District of Victoria. The aim remains the same: to breed big, uncomplicated, productive sheep with high quality fine wool. 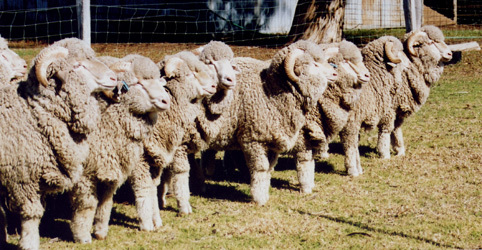 A small AI programme was undertaken most years until 2010 to maintain the high quality ewe base. The use of Rockbank(Vic.) superfine rams of Merryville bloodlines has reduced micron to about 17 microns over the first 3 years I was in Queensland. No doubt the climate and rainfall contributed as well. Over the previous 3 years the average was 18.1 mic. An extremely dry summer in 2006-7 forced a reduction in ewe numbers, but also a good opportunity to cull any ewe who was even slightly off type. The use of top sire Nerstane 47 many years ago over ‘NB’ daughters set the scene for some great show wins. 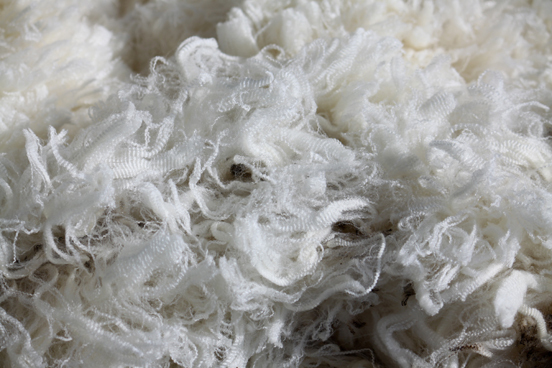 At last the scarcity of wool has forced wool and sheep prices to rise, a welcome event for those who have stuck with Merinos through some decades of terrible seasons and prices. The recent craze to rush into ‘shedding’ mutton sheep will soon throw up some problems that people haven’t really thought through as yet. Heavier sheep require more feed for starters, and a dry ewe is a waste of space for a year with no return at all. A self replacing Merino flock has remained the most profitable enterprize for many years in most areas; cropping can be a very dicey proposition as many found last summer when it was so wet and harvest in places impossible. We are at present facing a tough future with the added threat of climate change. Sheep are environmentally friendly compared with cropping and use minimal water; rice and cotton are not crops for this country. Less damage was done to our river systems when wool growing was the main industry. I think the following lines of doggerel that I penned years ago sum it all up! The kids these days would laugh and say, What a load of bull! Both use the greatest fibre the world has ever known. A trendy fashion statement, or insulating batts. And the ultimate in flavour… lamb with fresh mint sauce! The scientists cloned a sheep, and had to call her Dolly.. Typical of humankind’s never ending folly. Our numbers on the decrease, we fear for what’s in store. And the world’s greatest fibre could soon be history. Will air conditioners be switched off to save on precious power? We sheep can save the planet, so give our wool a go! AI ewes, 2007, after a tough winter. 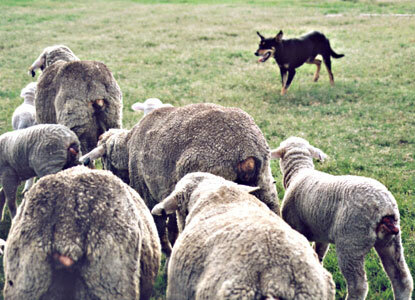 They had 3 hours full grazing each day and were penned each night in a yard hot wired for dingoes. Well mulesed ewes with lambs pictured about 1-2 weeks after mulesing. It can be seen from their ‘sappy’ condition that they haven’t suffered a setback. 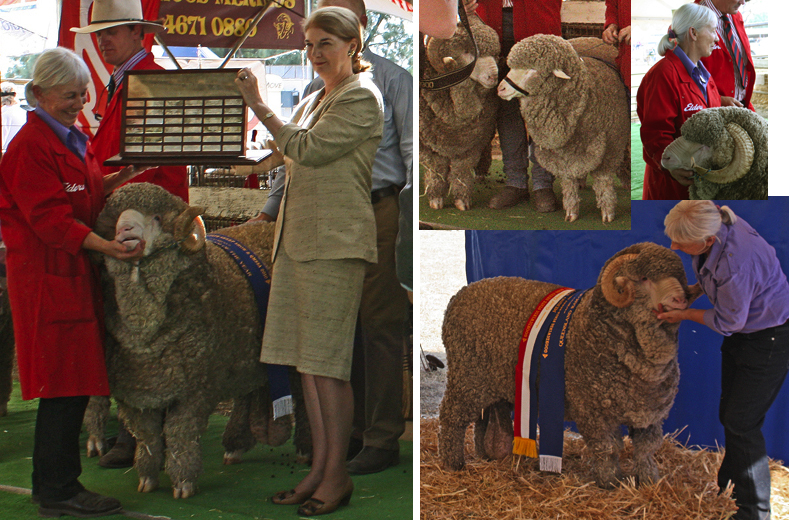 The State Sheep Show at Goondiwindi proved a bonanza for Karmala, Harry and Liz, the Queensland Pair from 2009 are now Queensland Ram and Ewe for 2010, and Harry was Grand Champion Ram! We will be heading down to Dubbo in August for the National Ram Comp. 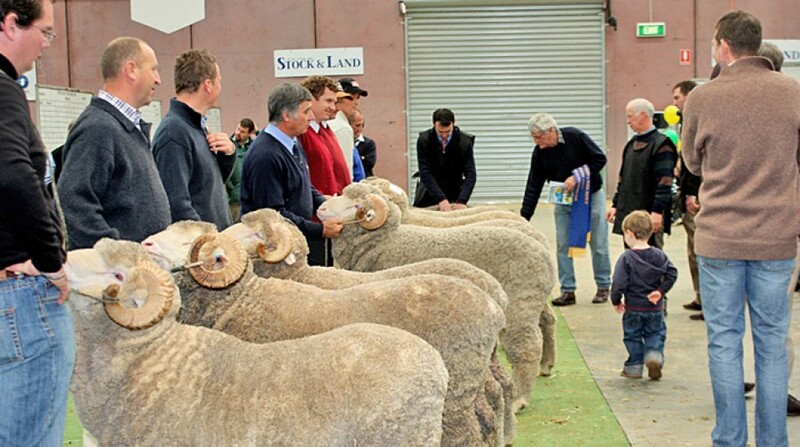 A young ram I bred won Supreme at Tenterfield, Feb 2010, which was a great thrill. A recent wool test came back at 17.9 mic with no fibre over 26mic. He’s August shorn and was competing against full wools from the NSW New England studs, including Nerstane! My team of four won 11 broad ribbons and cleaned up most of the August shorn classes, the young ewe beating my old Pair ewe from last year. The dry summer has suited the sheep and the lambs have done really well. These are by a young ram bred here, and are the most even drop I can remember. The show team and this sire are all by old NB out of Nerstane 0043 ewes. 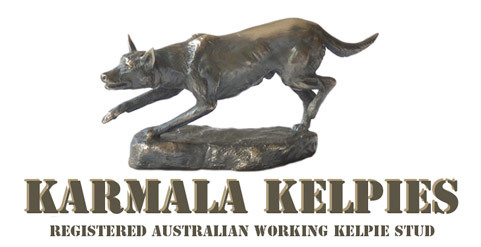 2009 was a good year for Karmala Merinos. I showed only 2 sheep, a ram and a ewe who are 3/4 siblings. They are both by old N.B. 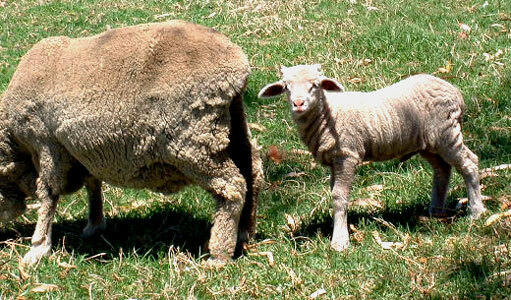 from ewes by Nerstane 43, one of the most influential AI sires in Australia. He was used with this purpose in mind, ie to breed some ewes that would suit NB, as he was leaving too much skin over Karmala ewes. I felt he had a lot of good points, and was determined to make use of him, so the success of the plan is very satisfying. These two sheep won the Queensland Pair at Longreach State Sheep Show, and went on to be runners up to One Oak in the National Pairs at Bendigo. 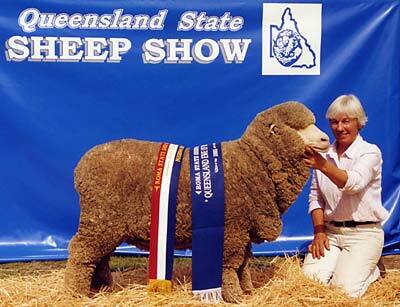 The ewe was Queensland Ewe of the year and the ram Reserve Grand Champ. of the show. They also did well when shown at Bendigo. Harry won the 2 tooth Fine wool class and Liz was Res. G.C. Fine Wool Ewe, being beaten by the eventual G.C. Ewe of the show. She should have been entered in the superfine classes but the AWTA test results hadn’t been forwarded and were unavailable at classification. “Lizzie” follows the tradition set by “Queenie” (by RockBank Junior Blue). 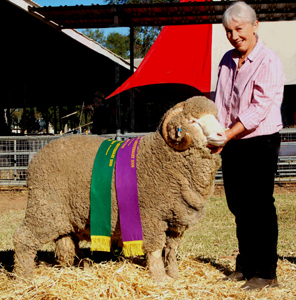 She was Queensland Ewe of the Year at Roma in May 2003 and went on to be Champion Fine Wool Ewe and Reserve Grand Champion Ewe at the National at Dubbo in August, 2003. Judge George Merriman said she was a lovely ewe, very even all over with hardly a fibre out of place! 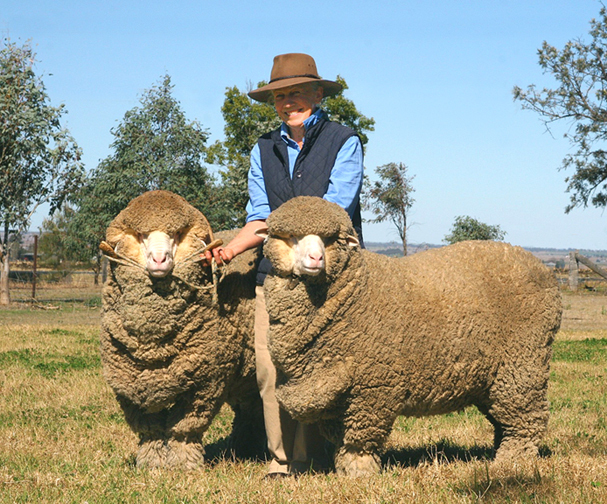 A twin son of Queenie was sold to Will Roberts, Victoria Downs Merino Stud, Qld in 2006. 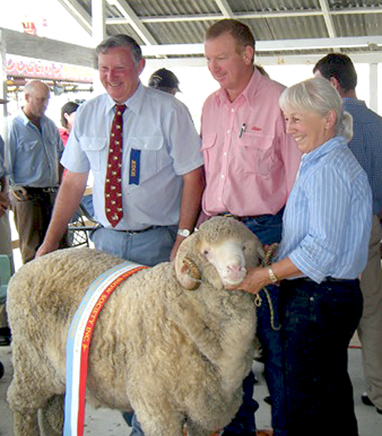 The fleece off Queenie’s first lamb won the Grand Champion Fleece at Toowoomba in 2007. I took a couple of ewes down for an ET programme at Alfoxton in 2005. 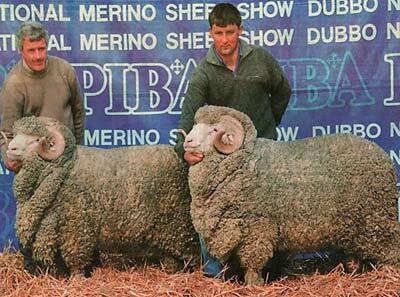 The results were disappointing, but it did produce a lovely ewe that won two Supreme titles in 2007. Thanks to Chris Clonan for his help. 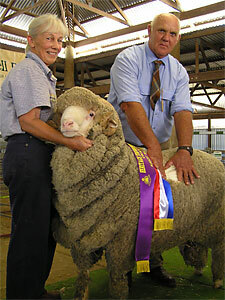 The ewe, Cindy, is by a syndicated Merryville ram and her fleece was Champion Stud Ewe Fleece at the EKKA, 2007. At the State Sheep Show at Goondiwindi. So what was Harry saying to Liz? He obviously has a comment for the Governor, Penny Wensley! Will ‘n’ me after he won Supreme at Tenterfield Show in Feb. at his first show. Harry and Liz before they left for Bendigo and the Australian Sheep and Wool Show. Photo by James Nason, Q’land Country Life. Queenie at Roma in May 2003. Queenie at Dubbo in August 2003. Supreme Exhibit in 2007 at Toowoomba and Goondiwindi. 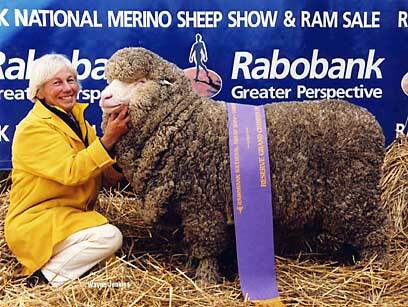 Cindy, who won several Supremes last year, is the proud mum of this nice ram lamb. Old NB(XRockbank PG) sired a few lambs from my best ewes before he died last winter. The Toowoomba Royal Show was held in School holidays this year and Jaimie and Tiana enjoyed showing their 15.5mic. ewe weaner. Jaimie is now 15 and this ewe is still going strong! photo: Richard Waugh, Q.Country Life. 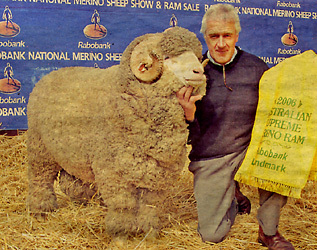 Champion Fine Wool Ram and Reserve Champion Ram of the show, State Sheep Show, Roma, 2008. Four outstanding Rockbank sires have been used by AI at Karmala. Three of them have won Supreme Exhibit awards at Bendigo, in 2000 (Roberto) and 2001 (PG), and the 2006 winner was also National Champion at Dubbo. 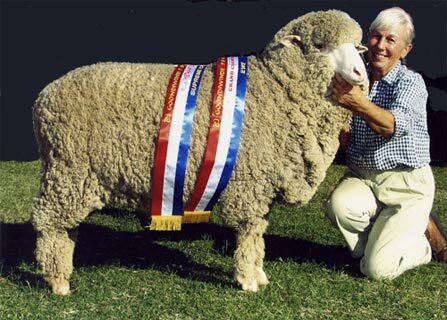 The other ram, Rockbank Bruiser, is sire of the 2006 winner. “N.B.” is by RockBank P.G. and was described by George Merriman as a potential impact sire; he has great size and presence with a very stylish wool. 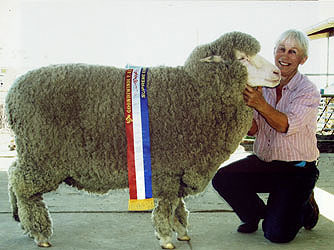 Grand Champion Fine Wool Ram at Roma. RockBank Roberto and RockBank PG. Photo by Wayne Jenkins, Dubbo, 2000. 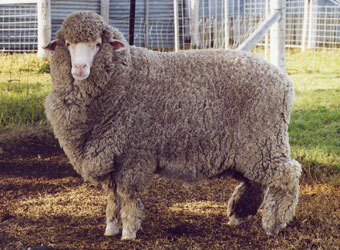 In 2009 Karmala showed Grand Chapion Stud Ewe fleece “ “ “. The fleece from Liz was Champion Queensland Fleece at the National Fleece Comp. at Bendigo in 2010. 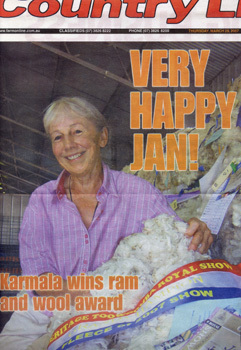 In 2012 Karmala won Champion Stud Ewe’s Fleece at the EKKA. 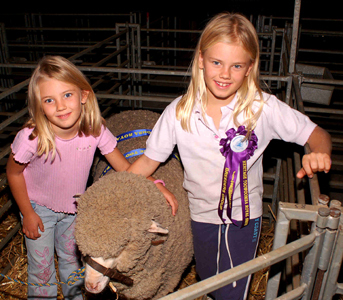 In 2013 the fleece off Maddie, Q’land Ewe of the Year, won Grand Champion fleece at the EKKA. The fleece off Maddie, Q’land Ewe of the Year, was Grand Champion Fleece at the EKKA this year. Maddie’s fleece before being packed off to the show. 6kg of 16.8mic. Supreme exhibit, Toowoomba Royal Show 2005. 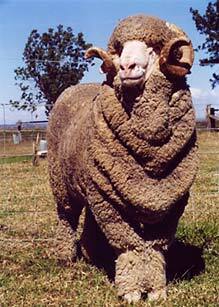 A Queensland-bred August shorn two tooth ram.